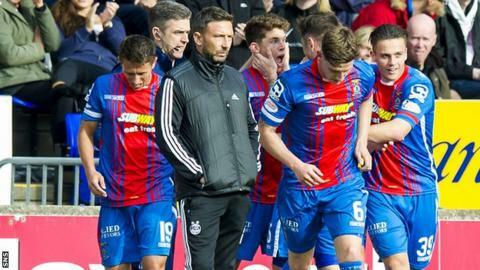 Premiership leaders Aberdeen suffered a second defeat in a week as Inverness took all three points in the Highlands. Miles Storey put the home side ahead with a cracking finish across goalkeeper Danny Ward after Ryan Christie slid the ball to him. Christie, who was sent off late on, hit a second, but Ash Taylor headed Aberdeen back into the game. Peter Pawlett and David Goodwillie both hit the woodwork in a frantic finale but the home side held on. A large travelling support filled the away end hoping their side would put their midweek League Cup exit to Hibernian behind them and continue their excellent league form. However, despite the defeat, they still hold a four-point lead over Celtic who only managed a draw at home to Hearts. Kenny McLean fired an early effort from distance which home goalkeeper Owain Fon Williams touched away. From then, Inverness took command. Danny Devine found Christie between the line of defence and midfield. He slid a perfectly weighted ball to Storey and the striker finished confidently across Ward for his third Inverness goal. Christie then released Ross Draper behind the defence and only a superb challenge from Paul Quinn prevented a second goal. Ward was inspirational as he tipped Liam Polworth's effort away but he could do nothing to stop a deserved second. Christie again found space and showed fantastic ability with a strike from 30 yards that dipped away from Ward into the top corner. Aberdeen responded with a Taylor header from a Niall McGinn corner which bounced high into the net. That sparked them a little but at the other end Ward produced another fine save from a Christie header which looked as if it has gone in, but the keeper flew across to tip the ball round the post. In the second half Aberdeen enjoyed far more possession and despite applying more pressure, they failed to directly trouble Fon Williams in goal until near full-time. Substitute Pawlett saw his curling free kick beat the goalkeeper but not the post as it bounced to safety. Christie's afternoon ended on a sour note when he crashed into former home favourite Graeme Shinnie to earn a second yellow card. The visitors really pressed as time ticked on. Andrew Considine scooped wide and Goodwillie slipped at the crucial moment with the goal gaping as his shot sailed well wide. Inverness demonstrated the value of good decision making in the final third. Aberdeen lacked that for most of the match. A second consecutive defeat for Aberdeen but a well earned and valuable victory for John Hughes' side in a very entertaining encounter. Match ends, Inverness CT 2, Aberdeen 1. Second Half ends, Inverness CT 2, Aberdeen 1. Owain Fon Williams (Inverness CT) is shown the yellow card. Attempt missed. David Goodwillie (Aberdeen) right footed shot from the centre of the box misses to the right. Attempt missed. Andrew Considine (Aberdeen) left footed shot from the right side of the box is just a bit too high. Second yellow card to Ryan Christie (Inverness CT) for a bad foul. Corner, Aberdeen. Conceded by Ross Draper. Corner, Aberdeen. Conceded by Owain Fon Williams. Substitution, Inverness CT. Nathaniel Wedderburn replaces Miles Storey. Peter Pawlett (Aberdeen) hits the right post with a right footed shot from outside the box from a direct free kick. Hand ball by Ryan Christie (Inverness CT). Attempt missed. Ash Taylor (Aberdeen) header from very close range is just a bit too high following a corner. Corner, Aberdeen. Conceded by James Vincent. Delay in match Ryan Christie (Inverness CT) because of an injury. Andrea Mbuyi-Mutombo (Inverness CT) wins a free kick in the attacking half. Danny Williams (Inverness CT) is shown the yellow card for a bad foul.